Toshiba NB Netbook, Episode 2. As the 8.9 inch sized NB 100 has recently been in our test lab, now Toshiba's second netbook coup, the NB 200, is already on the test-bench. This time, however, with a 10.1 inch display for an improved overview. The question, if the Toshiba NB200 can even be considered to be the NB 100's heir, as the implemented hardware of both models are by and large conform, or if it's simply a refresh of the NB 100 with a larger display and altered look, remains to be seen. The NB 200 has, like its predecessor - in view of the built-in CPU (Intel Atom N270 processor with 1.6 GHz), the according chip set and its onboard solution including the further equipment - nothing new, but does differ externally from this very much. If the somewhat chunky optic and the protruding battery was a critique point of the NB 100, the NB 200 doesn't allow for any critique here anymore. Note: Toshiba sells the NB 200 under various names specific to country. In Japan, for example, it's on the market as the Toshiba Dynabook UX and in the United States it's released as the Toshiba NB 205. 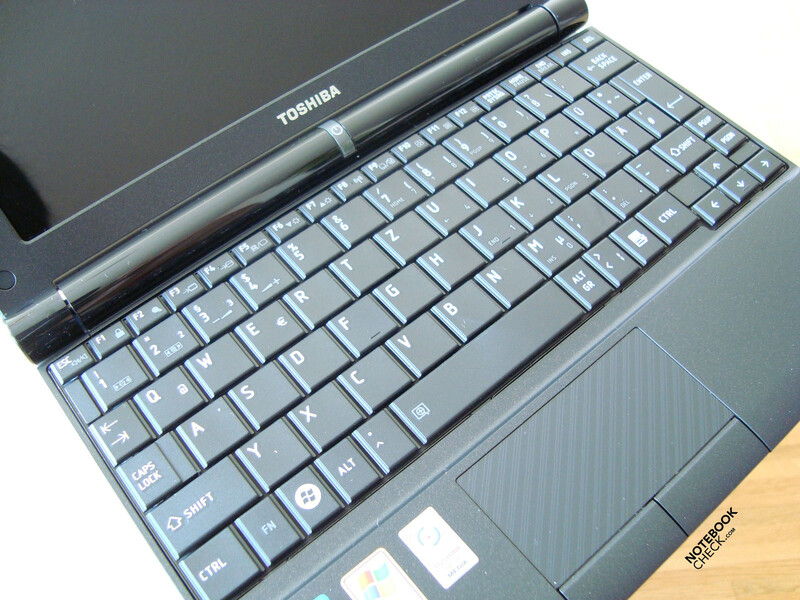 Toshiba's netbook of the second generation is presented as the NB200 here in Europe. 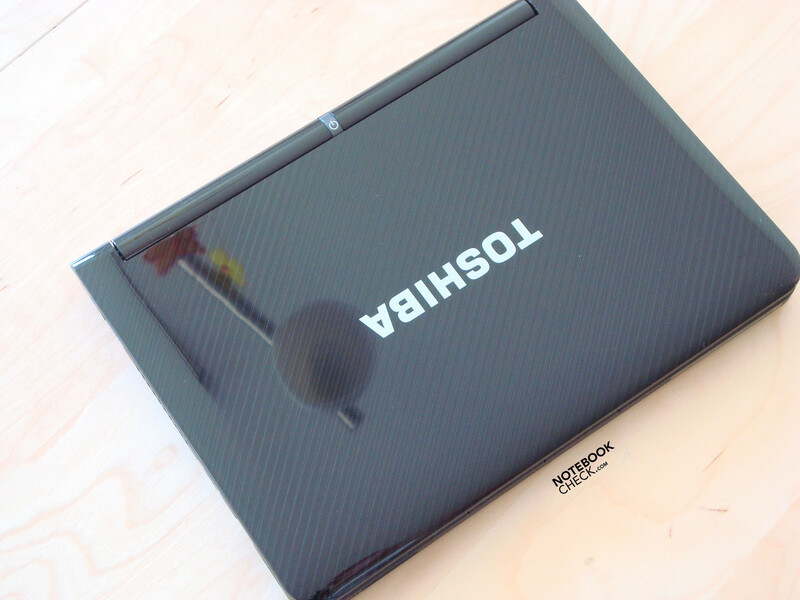 According to the manufacturer's site, www.toshiba.de, the NB 200 is available in two different variations, or rather colors, these being the classical colors black and white. The model in Cosmic Black is designated as NB 200-113, while the model in Snow White is labeled NB 200-110. Apart from the colors both models, according to the manufacturer, also differ in the hardware configuration and hence also accordingly in price. There are significant differences as to the keyboard, also. Our test report is limited to only the model in Cosmic Black, the NB 200-113, which has been made available to us. This is, as already mentioned, kept by and large in black, whereas the back side has fine diagonal lines from the upper right to the bottom left. This pattern is additionally found on the touchpad, which is very well integrated into the rest of the case's optic. The NB 200-113's receives an even more elegant touch through the high gloss finish of the display back, which we sorely missed in the predecessor model, NB 100. Not only did the optically not really advantageous protruding battery disappear, but the appearance has been definitely improved with the face-lifting. 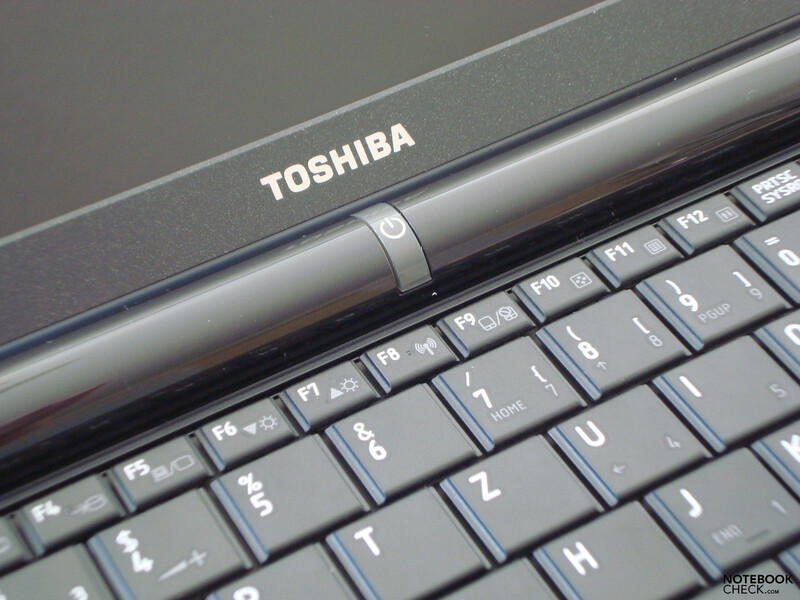 One feature that strikes the eye right away is the power button placed in the center, which is found directly under the "Toshiba" lettering and lights up when in an activated state. Toshiba hasn't only gone the extra mile in view of the NB 200 looks, but workmanship and stability could convince us, as well. All corners and edges have been well rounded and every single component has been assembled very cleanly. Even if the case is merely made of plastic, it puts away point pressure in the area of the wrist rests without further ado. Unpleasant creaking noises can't be elicited from yielding plastic at handling or at opening and closing the lid, either. The weakest area is once again, as in most devices with plastic cases, the display's back side, which does give away considerably under pressure. Otherwise, the case shows only a few weaknesses. The NB 200's display is held by two, fairly small, hinges, whereas the given stability is sufficient to keep the 10.1 inch sized display tightly in position. However, the offered opening angle is a bit restricted. The manufacturer Toshiba has omitted a closing mechanism because the display does quite well without and doesn't open erratically. 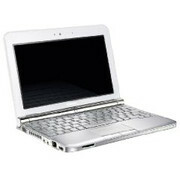 As to the connectivity, the NB 200-113 has, netbook typically, only the absolute necessary. eSATA or HDMI ports are something you may not find here, but the required standard ports needed every day, such as USB 2.0 ports, audio connections for a microphone and headphones, as well as LAN and WLAN interfaces, are all onboard. Merely the cardreader (2-in-1 Bridge media-in - supports SD TM cards up to 16 GB and MulitMedia cards up to 2 GB) are found on the NB 200's front side. The back side of the netbook is also rather uninteresting as to connectivity, because only the long three cell battery is located here and takes up the whole length. 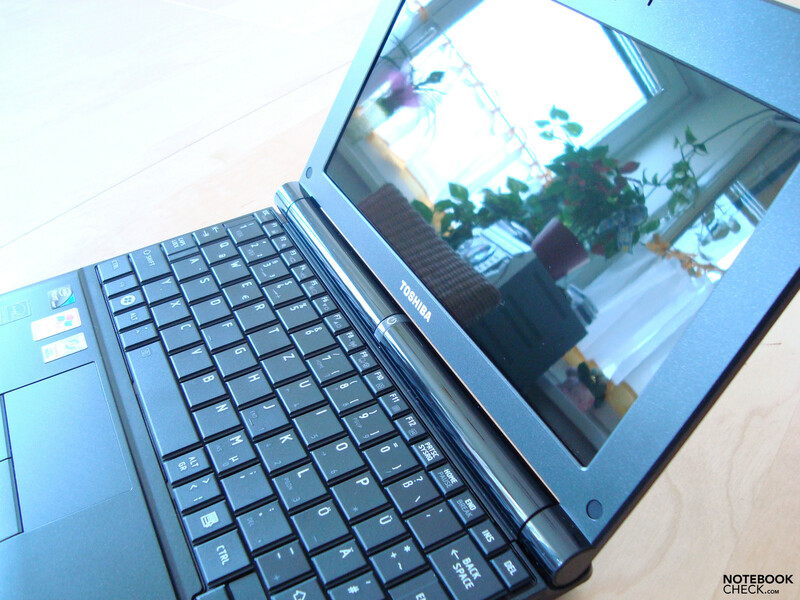 The left side of the NB 200-113 netbook accommodates, aside from the analog monitor-out, which allows a maximum external resolution of 1600x1200 pixels, also the louver, the two jacks for microphone and headphones, the LAN Port (Realtek RTL8102E/RTL8103E Family PCI-E Fast Ethernet NIC) and one of the three USB 2.0 ports with a Sleep-and-Charge function, with which the user can charge small devices, for instance an MP3 player or a cell phone, or provide these with power, even if the netbook is deactivated. The remaining two USB 2.0 interfaces are found on the right side, followed by the power socket and the Kensington lock. So much to the NB 200-113's external configuration as it is seen from the outer side. In the inside of our test notebook there is also a WiFi capable WLAN module (Atheros AR9285 Wireless Network Adapter), which supports the standards 802.11 b/g. Furthermore there is also a 0.3 MP webcam in the display frame's upper central area. Together with an internal microphone, videoconferences aren't a problem for the small and compact NB 200-113. Toshiba also offers an external DVD drive for the new NB 200 optionally, for cash, of course. Let's now look at the NB 200's input devices. The keyboard makes a good impression at typing and also the feel is quite good. The keyboard unit clatters somewhat here and there, but this doesn't have a negative effect on the typing feel. The key size has been adequately selected so that the NB 200 can do without an external keyboard when it comes to typing longer texts. The right shift key needed a bit of getting used to in the test, though. In our opinion, it would have been placed better farther to the right. 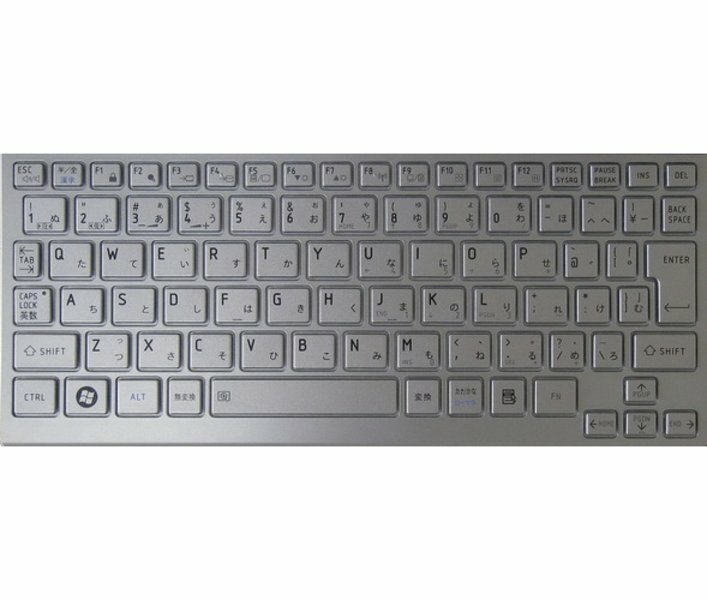 It also seems that the page up and page down keys on the right beside the right shift key have been placed here as a compromise because there wasn't any other place to put them, and so that they could be put somewhere halfway reasonable. Generally, the whole area around the cursor keys is very dense and makes a cluttered impression. The touchpad has, on the contrary, nothing to be criticized. The mouse substitute, striking through the diagonal line pattern and smooth surface, reacts quite well to our input. Both mouse keys also do their job as they should and turned out almost too large in view of size. Hence, it can happen now and again that you unintentionally come against one of the two with your palm when typing. 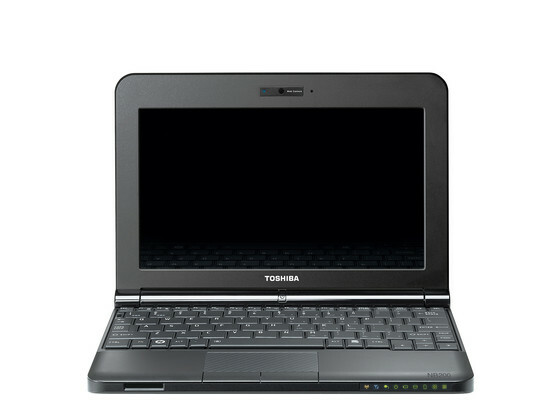 Note: In order to make the name Chaos NB 200/NB 205/Dynabook UX perfect, Toshiba came up with something special. As already mentioned above in the paragraph about the case, our test candidate is available in two configurations. Our test device is the NB 200-113 (Cosmic Black). The NB200-110 as well as the Dynabook UX, don't only vary in color, but apparently also have a different keyboard with a different, and in our opinion better, keyboard layout, particularly in the cursor keys' field. 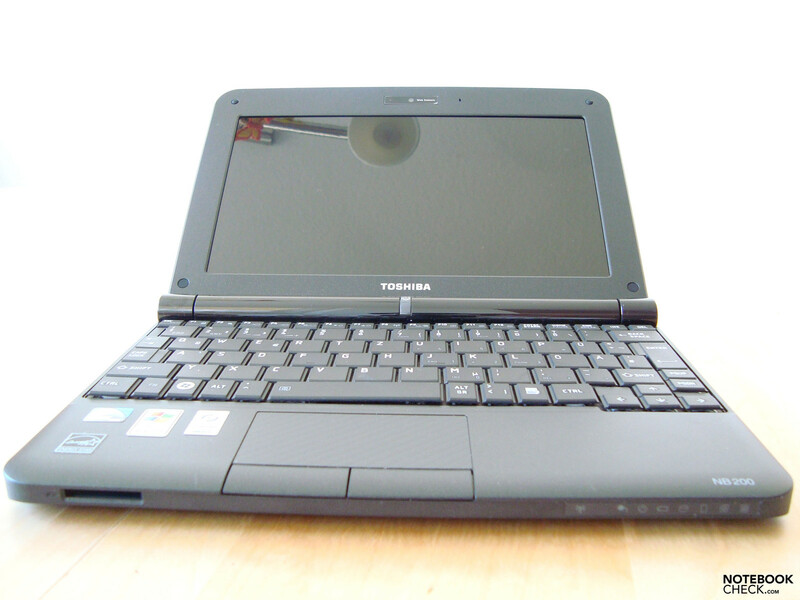 Unlike the NB 100, the NB200-113 netbook has a 10.1 inch sized TruBrite WSVGA TFT display with background light. Despite the somewhat larger display, our test candidate has the same maximum resolution of 1024x600 pixels as the NB 100 with merely 8.9 inches. A large flaw of the NB 200-113 is, unfortunately, the strongly reflective display. The netbook's utilization field is very restricted due to this. Even if the display brightness is satisfactory, outdoor missions are only possible to an extent in shady places. The display content is still recognizable when sitting on the balcony in the shade, but reflections do prevail obviously. At the very latest, working with the NB 200 in direct sunlight outdoors is only arduously possible, as it is especially taxing on the eyes. However, due to the reflective TruBrite display, the presented colors are saturated and bright. The horizontal viewing angle is rather generous in regards to the viewing angle. The vertical angle of vision isn't so spectacular. 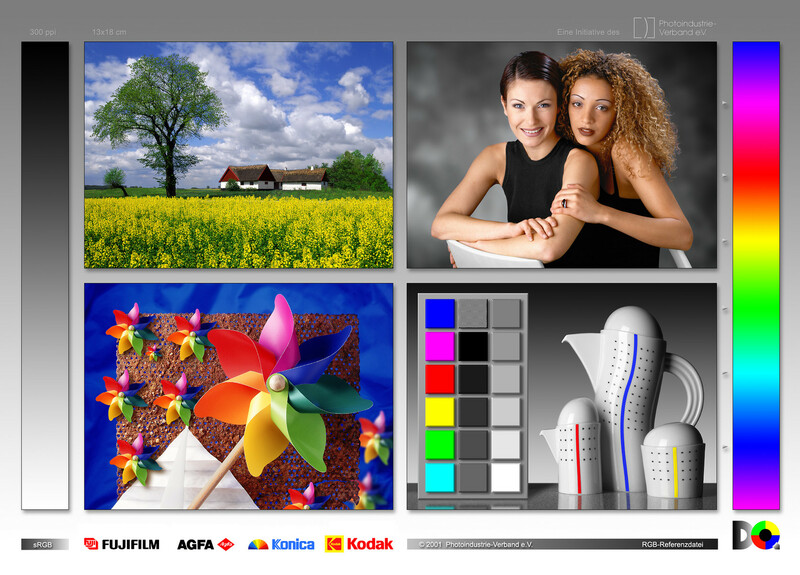 Regular display readjusting is necessary to prevent darkening and color changes, after changing positions, for instance. The display's maximum opening angle is small, though. As to the performance values, the NB 200-113 correlates to the NB 100 or those of many other manufacturers, which is hardly surprising because the implemented hardware, except for a few items, is almost the same in all devices. 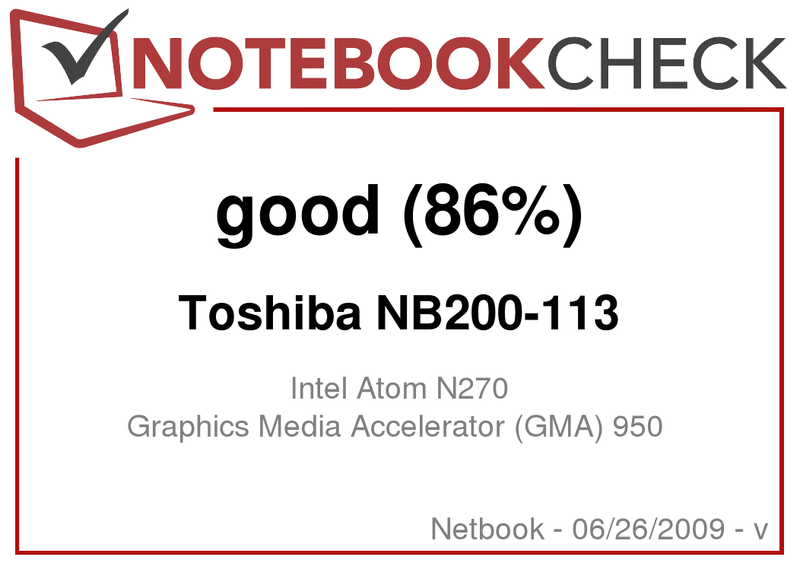 As the majority of netbooks currently on the market, the Toshiba NB 200-113 has an Atom N270 processor (1,60GHz, 512KB L2 Cache, 533MHz FSB) from Intel with the according chip set including the onboard graphic solution type Mobile Intel GMA 950, which branches off the required storage from the system memory, when necessary. A gigabyte DDR2 RAM from Samsung joins in, as well. The given performance is fully sufficient for common use, like internet surfing, writing and sending emails or working in office. Rendering music files or watching movies is also possible with the NB200. It first gets difficult at computing intensive application or even gaming, as the NB 200 is construed for mobility and just doesn't have the raw performance of a normal notebook with a dedicated graphic card. Multitasking applications can also lead to longer waiting periods due to the single core architecture of the Atom CPU. There are, of course, a few benchmark values this time in order to compare the netbook's performance with each other, too. The NB 200-113 reached almost 2953 and respectively 729 points in 3DMark2001 and 3DMark03. Not very surprising in comparison with the NB 100 model. Almost equal results were delivered in the PCMark05 with 1526 points and the results of the Cinebench run through. Our test candidate scored 526 and 802 points in the Cinebench Rendering test with single core and multicore. The evaluation for OpenGL was equally not surprising with 268 points. An in-house hard disk with the label MK1255GSX with a working velocity of 5400 revolutions per minute and a gross capacity of 120 GB is used for the mass storage device. For protecting data stored on the hard disk, there is a 3D fall sensor, which parks the disk head lightening fast and safe at jerky moves. 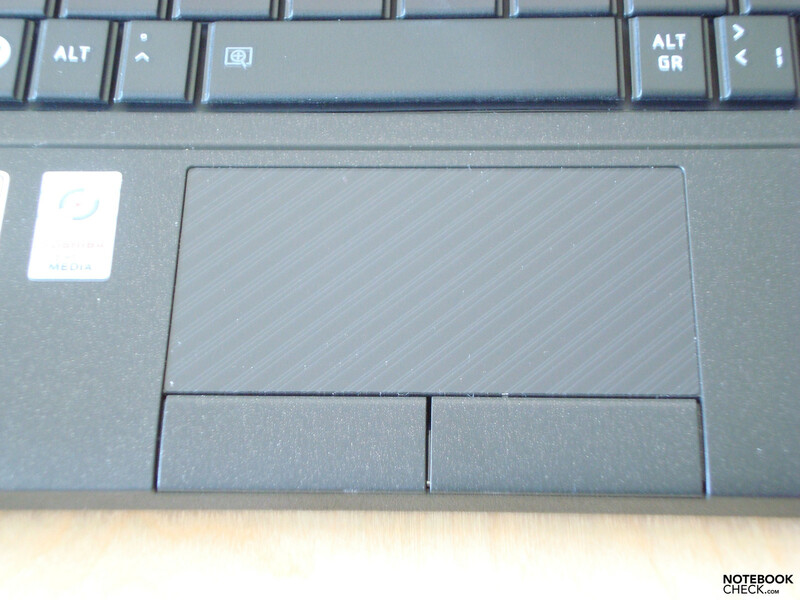 In our opinion, the fall sensor is calibrated a bit too sensible, as even at careful moving of the netbook you receive a report that vibrations have been established and the read and write head will be moved to a safe position. Toshiba shows almost too good intentions here, but as the saying goes: "Better safe, than sorry." The NB 200-113 presents itself in idle mode, as well as under load, from its best side in regards to system noise. You could almost think that our test candidate lacks a fan. With an average operating noise of around 29.7 dB(A) in idle mode, as well as under load, the NB 200 can very well be called a very quiet chaperone. After a few minutes of continuous load, you can hear the hushed sound of a starting fan, which makes itself noticeable with a quiet 31.6 dB(A), but turns itself down again after a short time. Furthermore there is a manual fan control, which can be activated with the key combination FN+F10. However, we couldn't establish a noticeable or measurable difference in volume. Despite its silent operating noise, the NB 200's operating temperature stays within a limit. A pleasant working is possible without problems at a "peak value" of 33.6 degrees Celsius on the top's upper left side. The temperature on the back side is somewhat higher with 35.1 degrees Celsius on the bottom side, but still permits a pleasant working, even on the thighs. (+) The average temperature for the upper side under maximal load is 30.4 °C / 87 F, compared to the average of 29.8 °C / 86 F for the devices in the class Netbook. (±) The average temperature of the palmrest area of similar devices was 29.3 °C / 84.7 F (-1.3 °C / -2.4 F). As quiet as the operating noise of the NB 200-113 may be, the maximum output of the built-in loudspeakers is also comparable with it. The given sound is clean and clear, but the maximum volume probably won't sweep anyone off their feet. This might be sufficient in quiet rooms, but the NB 200 could be drowned acoustically outdoors or in a slightly louder surroundings. 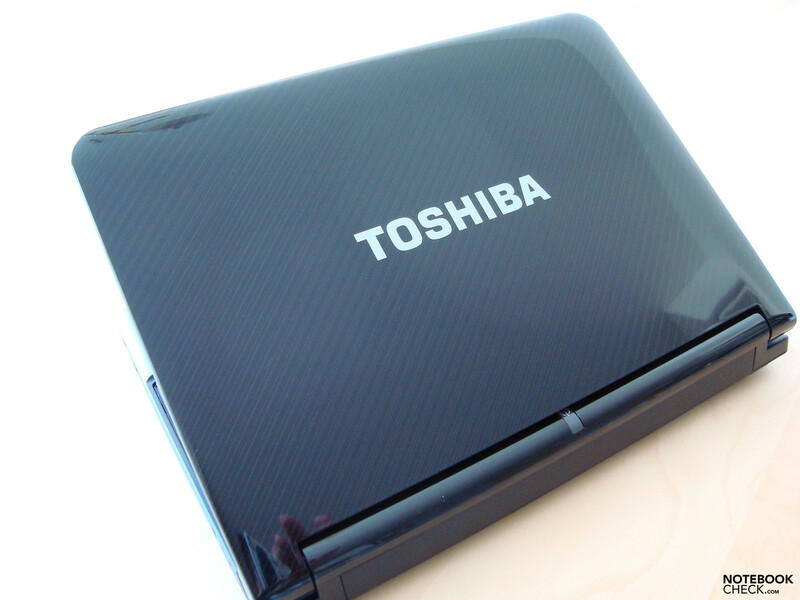 A 25 Wh (10.8 Volt, 2100 mash) Lithium-Ion battery from Toshiba is responsible for the NB 200's mobility. The included three cell battery helps Toshiba's NB netbook of the 2nd generation in the BatteryEater Reader's test (minimum brightness, maximum energy savings mechanisms, WLAN off) to 285 minutes, correlating to a good four hours and 45 minutes. The NB 200 achieves an average of two hours and three minutes (123 minutes) under load in the BatteryEater's Classic test, that is all on maximum and activated WLAN. We also tested the power supplier's stamina while surfing via WLAN at maximum display brightness. With a satisfactory 201 minutes, converted = 3 hours and 21 minutes, a certain degree of mobility is granted, whereas a few more minutes could be extracted if the display brightness is reduced a bit. Note: Our test device, the NB 200-113, was equipped with the small three cell battery, whereas the NB 200-100 is delivered with an efficient six cell battery for which the manufacturer Toshiba promises a mobile runtime of more than nine hours. Various internet researches have shown that the manufacturer hasn't promised too much. Runtimes of more than 8 1/2 hours are apparently possible. Aside from the significantly longer runtime and the additional configuration with Bluetooth 2.1, the better keyboard and hardware equipment, the surcharge of ca. 30.00 Euros is more than justified. 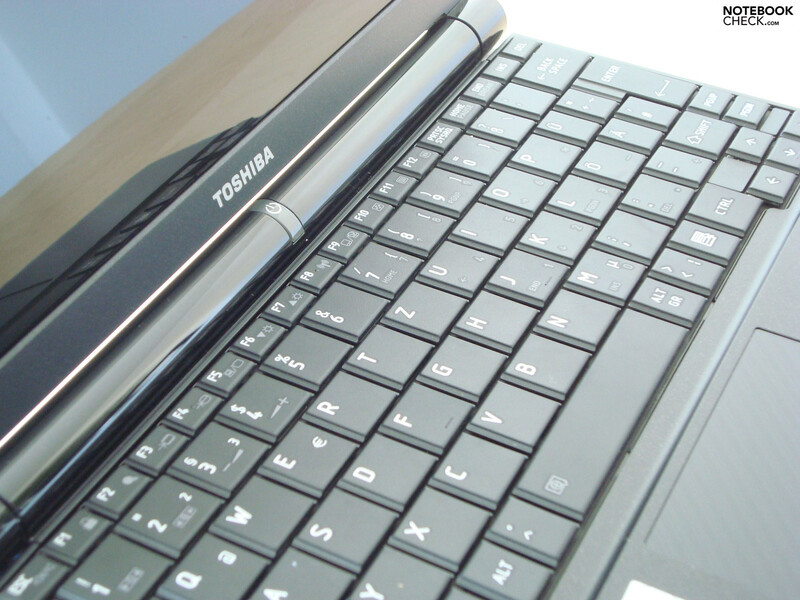 Toshiba unleashes their second netbook generation on customers. Even if there's little been done in view of hardware, Toshiba has really gone the extra mile in regards to optic and design - and we think with success. As the NB 100 looked more fit for purpose than elegant, and due to its protruding battery rather clumsy, there's no trace of this on the NB 200. Quite the contrary. The NB 200 makes a very elegant and chic impression, which allows it to compete with the Asus Eee PC 1002 HA or the NC10 from Samsung in view of this. The clean workmanship of the NB 200 could equally convince us. 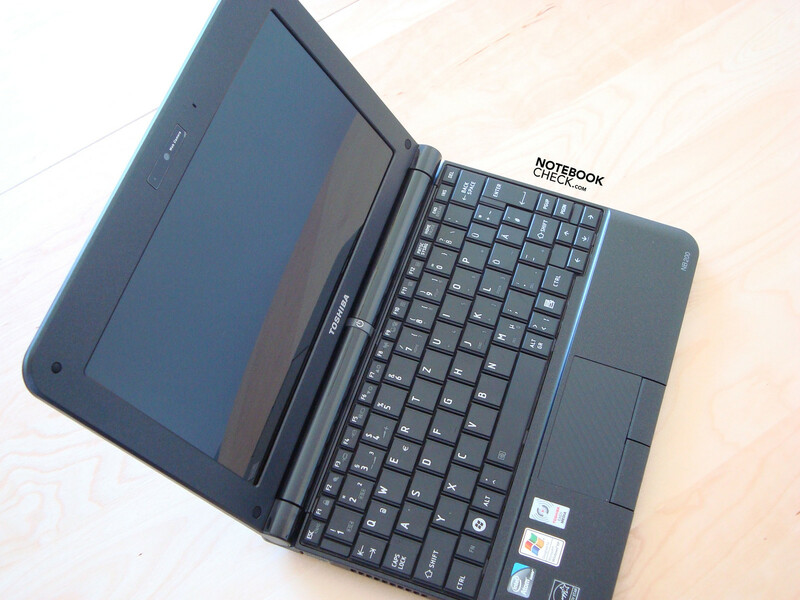 The implemented hardware of our test sample is quite identical to that of other netbooks. The NB 200-113's computing performance is ensured by an Intel N270 processor with a single core clock of 1.6 GHz. A mobile Intel GMA 950 GPU is responsible for the graphical presentation. It's well in the race with one GB RAM - for a netbook. This can be increased up to two GB RAM, for those who need more. With a 120 GB hard disk, with a velocity of 5400 revolutions per minute, there should be enough memory for the start in order to store multimedia files like music or movies. Security matters are taken care of by a built-in 3D sensor, which removes the HDD's read and write head from the data carrier lightening fast when jerky movements are detected in order to prevent data loss by shocks, aside from various password checks, which have to first be activated. 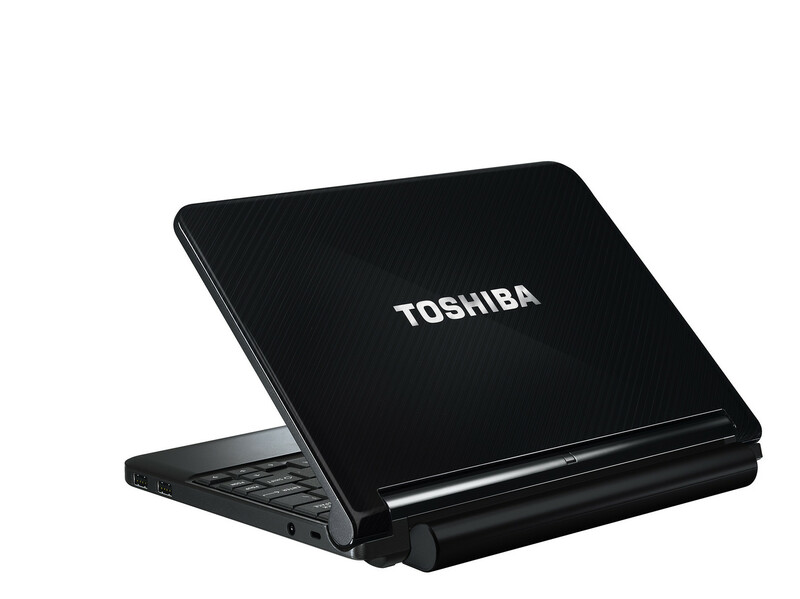 Generally you can say that Toshiba has taken a large step forward with the NB 200. If the first work couldn't, at least optically, keep up with the competitors, the NB 200 now mingles at the front. A bit more audacity to experiment or the one or other innovation to set itself apart from the broad mass of netbooks, wouldn't have hurt, though. 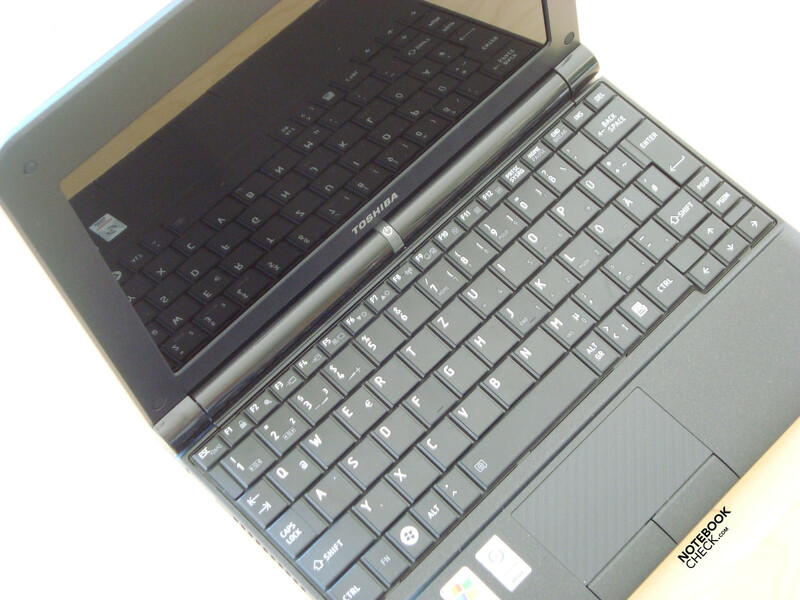 But even without, the NB 200 enqueues itself into the netbook upper-class. 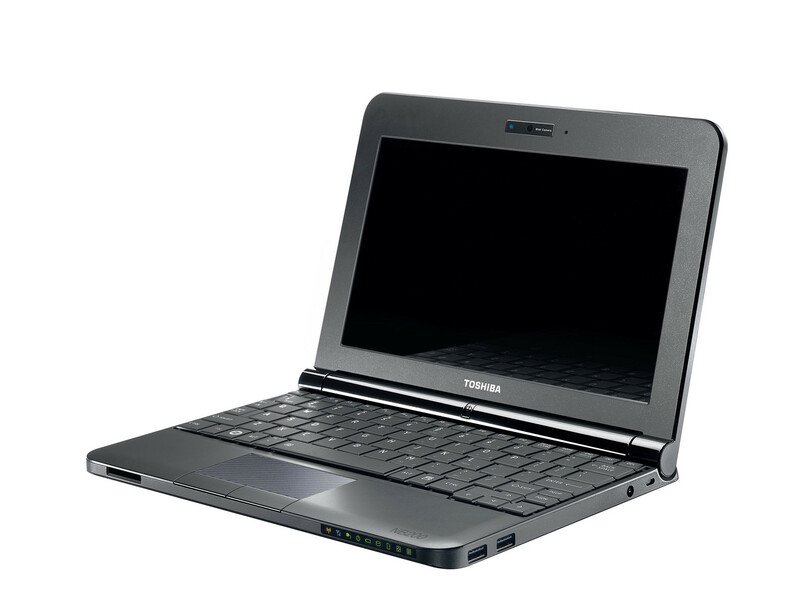 Toshiba extends its netbook range by the NB 200 series. The NB 200-113 in Cosmic Black was in our test. The design with the diagonal line pattern has turned out very well. The NB 200-110 in Snow White is also part of the NB 200 family. With a total weight of merely 1.18 kg, including the three cell battery, the NB 200-113 is light enough to be taken everywhere. 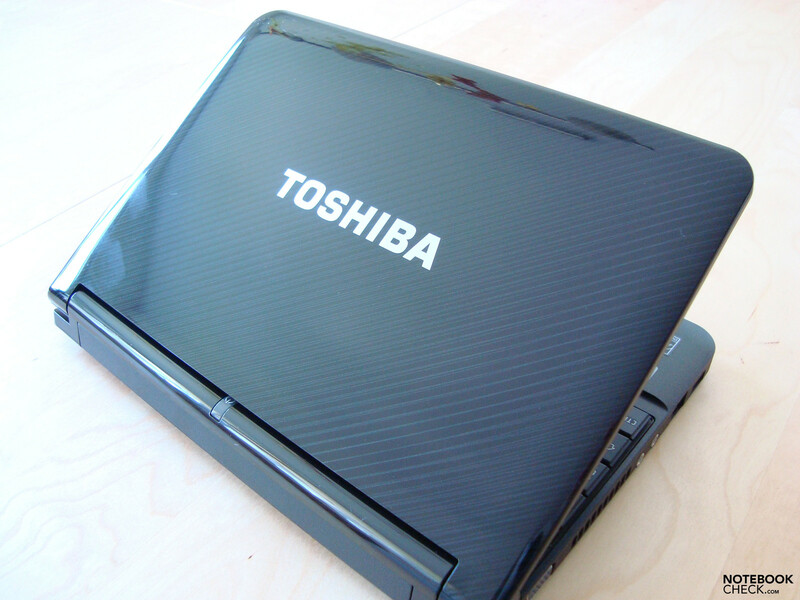 The manufacturer Toshiba offers an external optical drive optionally, which is simply connected via USB. In view of connections, the NB 200 has all common standard ports such as USB 2.0, an analog video-out, jacks for microphone and headphones and a card reader. With the adequate headphones this little blunder is eliminated quickly and easily. Other than the low maximum volume of the built-in loudspeakers, the NB 200-113 doesn't permit itself any further weaknesses. A further display flaw is the very low opening angle of the NB 200. There's no more to expect as seen on this picture. Unfortunately, the NB 200's display is reflective again, which restricts the outdoor suitability quite a bit. But at expense of the right lower area. The cursor keys and their surrounding make a very cluttered impression. The implemented keyboard gives a good typing feel. The power button, which is located on the NB 200 centrally under the display and lights up in an activated state, is an eye-catcher. 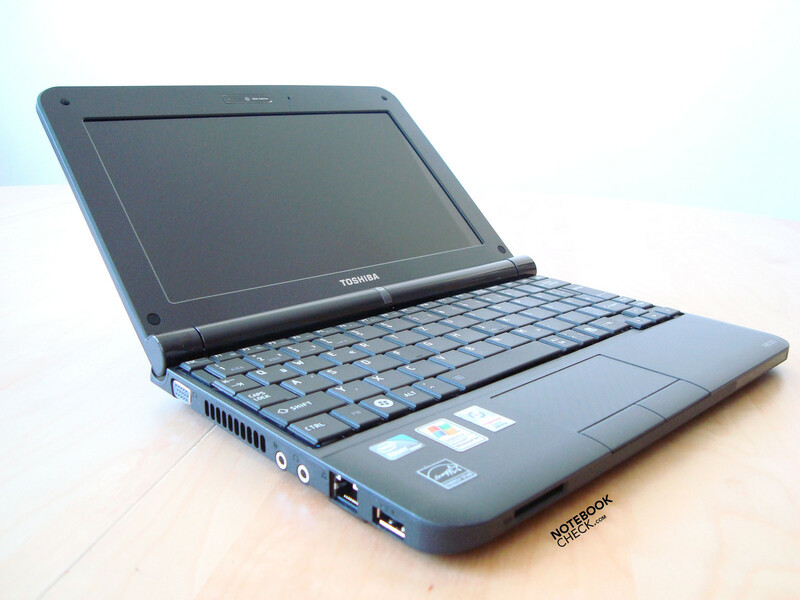 The NB 200-113 does play in the league of high-quality netbooks. This doesn't only have a different color but also, aside from a better hardware configuration, a different keyboard comparable to the Dynabook UX. The new optical make-up with the fine diagonal lines has something. The case and its qualitatively high workmanship could also convince. Even if barely anything has happened with the hardware configuration, the jump from the NB 100 to the NB200 is, already from the external overall impression, very visible. A bit more continuity for the model names would be nice. 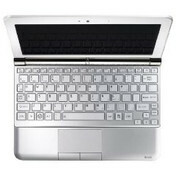 Dynabook UX, NB 205, or NB 200 in our latitudes - you quickly lose the overview. Why not bring them to a common denominator? 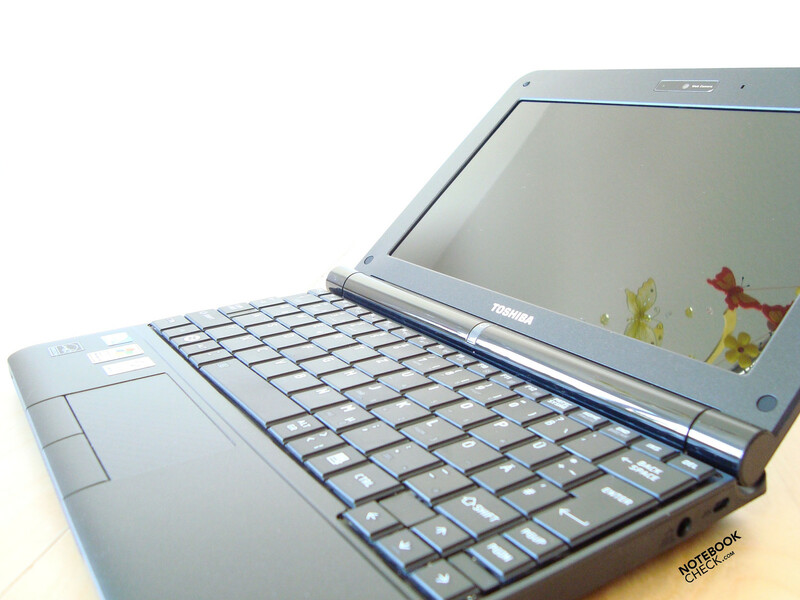 That Toshiba still and exclusively build in only glare type displays in their netbooks, whereas especially netbooks are taken everywhere because of their handiness and compactness - hence, also outdoors.